Continuing on from last week's overview of alternate picking vs sweep picking for guitar, we're going to show you how to best use alternate picking (in combination with a few sweep tricks, if you dare) to play some of the super-fast tremolo riffs. But what is tremolo picking? Tremolo picking is traditionally the technique we use to play extremely fast, removing rhythm from the picking hand and replacing it with a barrage of individually picked notes that create a very unique sound. If you think of Zorba the Greek, surf music, Gojira, black metal....they all use riffs that involve tremolo picking. Generally, the riffs will involve picking the same note lots of times in a row, which makes them perfect for alternate picking! Riff 1 is the easiest to master - simply try some down up picking on the bottom string, slow and even to begin with. In total, you'll play 4 beats of the open string, 2 beats of the G on the 3rd fret and 2 beats of the F# on the 2nd fret. If you tap your foot with the beat, it should be easy to feel when to change without having to count too closely. Loop it, getting faster and faster, keeping your picking wrist relaxed. If you're tensing up, that's easy to fix - slow down and FORCE yourself to relax! Sounds counterintuitive, but if you just think about having a floppy, relaxed wrist, you'll play it much better, even if it is a little slower in the short term. Riff 2 is trickier because you're now moving across strings. Be careful you don't miss a note or get any extra string noise as you move between strings, and slow down if you need to make it cleaner. Riff 3 is a challenge because you don't get any breaks - every beat your changing frets! However, the technique for your picking hand is the same as Riff 1. Will Adler from Lamb of God showing some poor technique (but some awesome playing regardless). Do you leave your pinky finger touching the body of the guitar? Maybe you rest your wrist on the bridge when you play? Bad news, fellow guitarist - you're anchoring. Anchoring is an extremely popular technique, but it is fundamentally a crutch we use to steady our hand at the expense of fluidity and added tension. I see this technique most commonly in the self-taught, and yes, I do often make the mistake myself when I get onto tricky phrases or fast patterns too, so don't assume I'm just telling you this because I don't anchor, but you should stop anchoring when playing if you want to get fast. If you are anchoring, stop yourself right now. Slow down the riffs, correct your technique, then get faster. Your wrists, forearms, elbows, back and shoulders will thank me later! In addition to this, you'll become better at riffs that move across strings and have more pick control in the long run if you don't rely on anchoring. The only exception to this rule is anchoring whilst palm muting or whilst muting strings for musical effect, which is not the same thing as anchoring for stability. If you need to rest on the strings for musical reasons, that's ok, just keep as relaxed as possible and make do, but don't ever restrict yourself by anchoring by default! Ok sorry - I'll stop harping on about anchoring and hand position for now. Here are a few licks to get your tremolo picking into lead guitar territory. Lick 1 is similar to Riff 1, just on the top string and much higher up the neck. 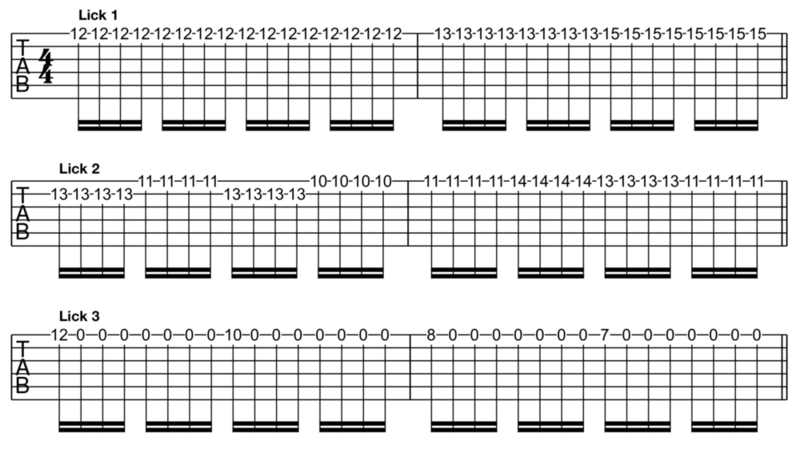 Lick 2 is similar to Riff 2, but a little trickier to fret for your fretting hand. Don't let it distract you - it's ok to go slower until your fretting hand is working automatically. Lick 3 requires very fast co-ordination between your two hands, as you're going to be playing a note for a semiquaver - literally a fraction of a second even playing the riff at slow speeds! This lick will help you develop one of the most important tricks to playing fast, which is getting your hands to co-operate and play at the same time. Use your metronome. If you try to beat your fastest speed each day or week, you'll get there. Just persevere. Look at your playing in the mirror or record yourself. Are you moving your pick too far? Maybe try smaller, softer movements. Turn your pick at a different angle. Cutting through the strings will reduce friction, making it easier for you to play without getting caught. Try a heavier or smaller pick. Heavier picks have less give, which means faster feedback from the string to your hand. Smaller picks give the same effect, as they have less flex and get you closer to the string for minimal movements. Incorporate tremolo picking into your soloing and riffing for added flair. It's great fun and it'll help you transition between tremolo picking and other picking styles, rather than treating tremolo picking as just some exercise you do. But wait, you mentioned we'd also do some sweep picking! If you are finding it hard to move across strings while tremolo picking, you can actually put in a little sweep pick to make your picking slightly more efficient. By playing two down's in a row like that, you basically just let your pick 'fall' onto the next string. Then, you'll 'lift' it back into the second string on the way back up. Confused? Just try that picking I've put above very slowly, with the barest minimum pick movement you can possibly get away with. It will start to look very natural and easy! Next week, I'll give you some sweep picking techniques to help you out a bit more with that technique, but for this week, I want you to go nuts with alternate picking. It's great fun to practice, and it'll only take you a few minutes per day! Older PostAlternate Picking vs. Sweep Picking - Which is Best?